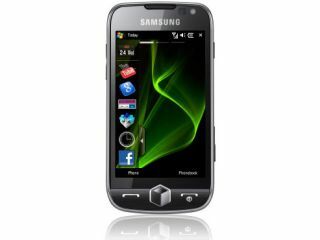 Samsung's latest creation, the Windows Mobile-toting i8000 Omnia2, has leaked onto the web thanks to a Lithuanian online retailer. The new phone apparently brings 3.7-inch AMOLED screen with widescreen VGA resolution, 8.1MP camera the 'Cubic' system that's been seen on a number of other leaked handsets already, and of course Windows Mobile 6.1. TechRadar has often noted the, at times almost childish, similarities between LG and Samsung, and the Cubic system (seemingly denoted by the cube-style button on the front) is very close in detail to LG's S-Class, although with Samsung you can interact with all six sides of the cube rather than four. Other specs for the forthcoming phone include the mandatory 3G, microSD support (to supplement the paltry 150MB on board) and a TouchWiz skinning of the WinMo system, which we'd assume would be upgraded to 6.5 when the new OS launches. The Omnia name was set to make its debut with the Omnia HD, which was released this month, but at the last minute it was changed to the (obviously far more catchy) i8910 HD instead. It was rumoured that this was to do with a high return rate on the original Omnia, but we were told by a high-end Samsung source that it was just to keep the Omnia name with Windows Mobile, which sounds reasonable considering this latest leak. We've no word on when the handset will launch, but given there's fevered speculation that the 'Unpacked' event on 15 June will see the Cubic system's debut, perhaps it could even be as soon as that? We managed to find a video of the new phone in action, so have a look at a minute and a half of someone not quite being able to press the fiddly Windows Mobile buttons Samsung has so clearly tried to hide.